With all the comforts of home and the amenities of a beach home, Bella Luna is the perfect vacation destination! Three floors, five bedrooms, and plenty of outdoor living space provide enough room for groups of all sizes to relax. The home’s multiple balconies overlook a private, heated pool and are perfect for enjoying views of the neighborhood’s lake. The community beach is just a short walk away and beach chair service in included everyday of your stay from March through October! A large, tiled foyer leads to the first floor Guest bedroom. The large bedroom has private access to the pool deck and has plenty of seating if you want to get out of the sun and relax around a flat screen TV. There are Twin over Full bunkbeds and a convertible sleeper sofa in the room. The laundry room with full-size washer and dryer are located on this floor. 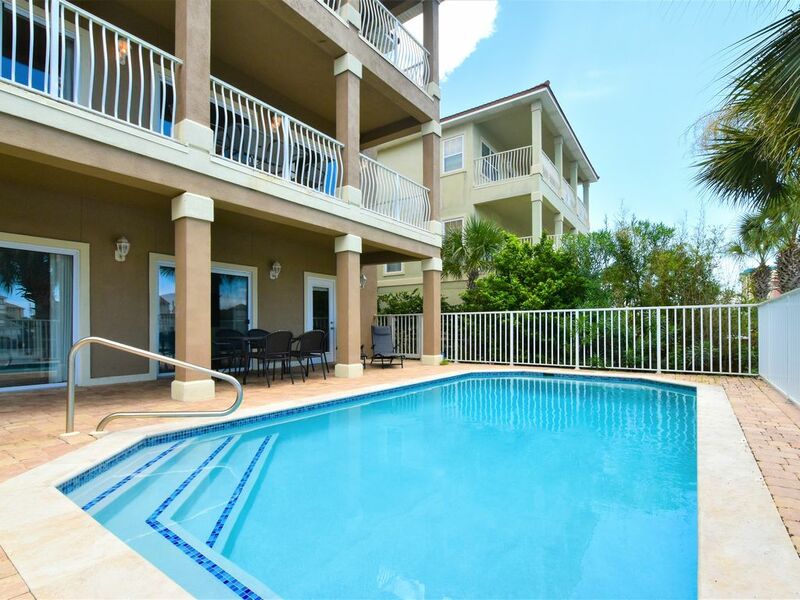 The main level of this home is a perfect place for everyone to enjoy the Destin lifestyle. Four sets of sliding glass doors open to the expansive lakeside balcony. The living area is comfortably arranged around a flat screen TV. The adjoining dining area has seating for eight comfortably. The fully-equipped kitchen features granite countertops, stainless steel appliances, a flat-top stove, and deep double sinks. This kitchen is well-stocked with the dishes and utensils you will need to feel at home! A marble-top breakfast table seats four and there is additional seating for two at the breakfast bar. A Guest bedroom with a Queen bed and flat screen TV is located on this floor. A Guest bathroom that is centrally accessible from both the bedroom and living area complete the 2nd floor. The couch in the living area also converts into a Queen bed for larger groups. The Master bedroom is richly decorated and has a King bed, flat screen TV, and private access to the third floor balcony. A Twin daybed provides extra lounge or sleep space. The Master bathroom has a double vanity, jetted tub, and separate walk-in shower. Two additional Guest bedrooms are located on this floor, one with a King bed and one with Twin over Full bunkbeds. Both bedrooms have flat screen TVs and share a hall bathroom with a tub/shower combination. Founded in 2006, Compass Resorts offers travelers a wide variety of vacation rental homes in the greater Destin area. From 1-bedroom condos to 7-bedroom Gulf-front houses, all of our rental homes meet the highest Quality standards. Compass Resorts offers vacation properties in Central Destin, South Walton, Holiday Isle, and Okaloosa Island in sought-after communities like Destiny by the Sea, Dunes of Destin, the Silver Beach Towers Resort, Silver Shells Beach Resort and Spa, Destin Towers, and many more. The Compass Resorts website provides detailed information about all of our communities and vacation homes - as well as local events, area information, and concierge recommendations. Our mission is to deliver the highest quality Vacation Rental Experience as measured by Guest satisfaction. We listen intently to the needs of our Guests, and do business fairly, honestly, and with the highest level of care. Each year, we welcome thousands of families to the Destin area, and we enjoy making them feel right at home. The dedicated staff of Compass Resorts makes the difference! Kitchen, bath & hand towels provided. Guests should bring their own pool & beach towels. We loved the location of this rental. It was 2 blocks from the beach and it was part of a private beach. We also loved the private heated pool. Overall the house was decent. The only way to get to the private pool was to go through one of the bedrooms or through the garage. The kitchen and main bathroom are on the second floor. Would have been nice to have that on the main level and to be able to walk out to the pool from there. Didn't have enough garbage bags, dishwasher detergent, and some other miner things to get us through the week so we had to purchase our own. Other than that, we had a great vacation. Destin is Beautiful! Near the beach, the house was very comfortable, we had excellent vacation. The house was in excellent condition, 100% recommended. What a great time we had. The house was clean and well maintained. Really, really enjoyed the pool. Easy access to the beach. Professional people, who were most helpful and very nice. We would do it again in a heartbeat. Many wonderful memories were made. Wonderful residence, we will definitely stay there in the future. Rates listed do not include fees or taxes.